Spend a memorable Missouri vacation or weekend getaway with your friends in the Gillmor Room at Hawthorn B&B. Named after Lottie Gillmor, a former owner of Hawthorn whose portrait hangs in the room, this cozy room is decorated in dark green with rose and white floral print accents. A large brass bed sits in the bay window, beckoning you to cuddle up with a good book. The private bathroom has a tub with a sliding glass door, as well as generous-sized towels, a hair dryer, an assortment of soaps, shampoo, lotions, and makeup remover towelettes. The Gillmor Room also features a sitting area with a small writing table and chairs and two armchairs, and a wardrobe for hanging clothes. Perfect for a girls’ getaway, group lodging, or a mother-daughter weekend, this guestroom has space for an additional twin-sized rollaway bed. There are B&Bs that feel like hotels and others that feel like a home. 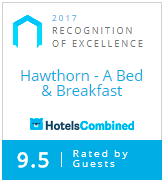 You have made Hawthorn feel like OUR home.